These easy-seal reclosable bags offer the ultimate in convenient food storage. Each bag measures 18cm by 20cm and is suitable for use in the fridge or freezer. 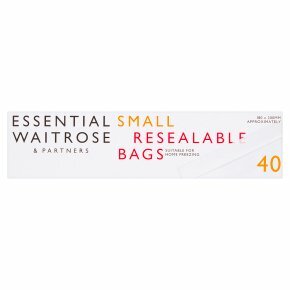 The roll is made up of 40 of these small bags and is part of the essential Waitrose range. Safety First:To avoid danger of suffocation keep this bag away from babies and small children. To prevent bags from opening when freezing, do not overfill.. Allow hot food to cool fully before putting into the bags.. Not suitable for use in conventional, microwave or combination ovens.. Not suitable for cooking or reheating food.